Windows 10 issues ? - Set G8JCFSDR.EXE to "Run as an Administrator"
The G8JCFSDR is an SDR which uses RF front-end hardware to down-convert RF frequencies into the 0~24KHz range accepted by most PC soundcards. The PC reads in the soundcard signal and carries out all of the filtering, demodulation, AGC, and notch filtering in software rather than hardware as would be the case in a traditional receiver. Because the receiver is all software, there are things you can do which would be almost impossible in h/w, how about -100 dB filters for a start ! 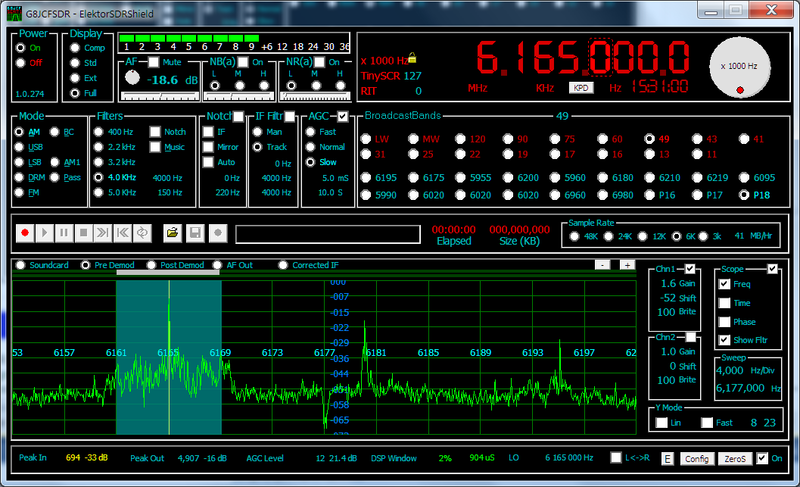 This is Peter Carnegie's (G8JCF) Software Defined Radio. Ulf Schneider's front-end H/W is available from sat-schneider for about EUR 250-00 (GBP 171-00, USD 320-00). The DRT1 is a very high performance 0~30MHz to 45MHz IF to 12KHz final IF down-converter. I have designed several SDR h/w front-ends myself, and I can truly recommend Ulf's DRT1 as one of the best down-converters you can easily buy. The NTI DRB30 is very similar in performance and comes completely boxed.